It’s partly about platform choice. As examined last month, home assistants like Amazon Echo have a disproportionate share of attention. Despite being a media darling, Echo’s ~15 million global installed base is dwarfed by the 3.2 billion global smartphones, where voice search increasingly occurs. So it’s a question of where local media players should develop apps, or “skills” in Alexa parlance. This is an extension of the mobile platform choice — iOS vs. Android — that faced developers over the past decade. But now the party is joined by Amazon (Alexa), Microsoft (Cortana) and Samsung (Bixby). To decide where to place one’s chips, it’s best to ask what drives each of the above players to provide voice assistants in the first place? The answer can inform where they’re going and where they’ll shine. And that in turn informs which one aligns with your target audiences, use cases and functionality. The reason each invests in voice is the same reason tech giants ever enter new areas: to embolden core products. Google is keen on voice (and visual) search to counterbalance the search volume lost on smartphones. Amazon sees it as a way to get you to buy more stuff — its core business. Apple’s incentive with Siri is selling more iThings, using a wide set of native OS features as the carrot (though Siri may be doing more harm than good). This principle exists down the line with Samsung (hardware sales), Microsoft (software ecosystem) and others (Facebook?) flirting with voice search. The main point: These motivating factors triangulate each platform’s positioning and strengths. Any voice apps that are commerce-related will obviously shine as an Alexa Skill. Anyone looking for greater reach with mobile voice should look to the Android-propelled Google Assistant. But the real question is which voice platform will attract the most users? That’s a question of who ultimately has the better AI engine: Which is best at voice queries and AI-fueled personal suggestions? The answer is Google, based on its sheer volume of search data and knowledge graph. Speaking of knowledge graph, the elephant in the room is how this will all impact SEO. This is a controversial topic for an entirely separate column, but the short answer is that voice search’s “one-answer” structure changes the calculus of search rankings. Google has trained for this day through years of one-box knowledge graph results in core desktop and mobile search. Given that voice searches are mostly natural language, one-result voice answers extend naturally from that knowledge graph paradigm. The trend towards this one-result SERP can best be seen in Tidings’ Evolution of Local Serp Topography. In it, Local SEO veteran (and SFSW speaker) David Mihm projects the trending of SERP formats. Traditional web results will diminish while knowledge graph results grow. Lots of search will likely continue to live under traditional SEO rule — such as the other 80 percent of mobile and most desktop. 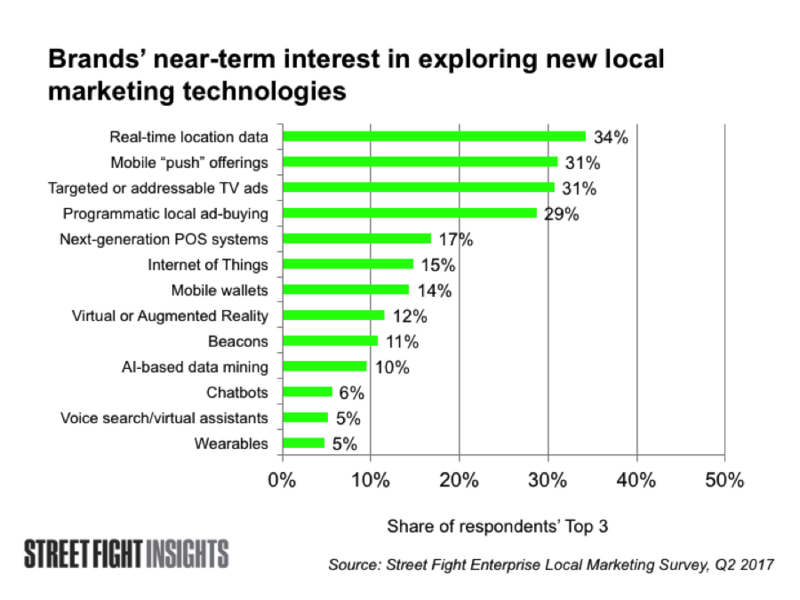 But the above signals should compel local media players to think about voice strategies, such as helping local advertisers optimize for natural language queries. And it’s clear they may need it. 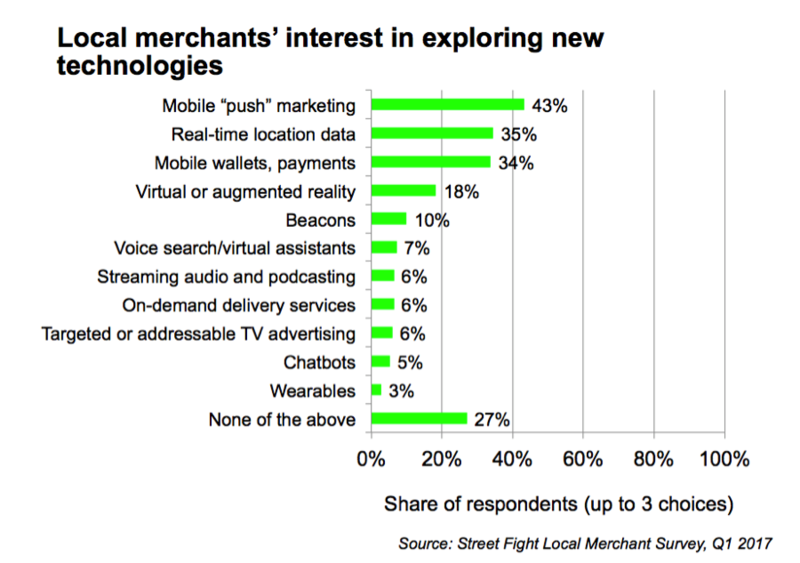 In Street Fight’s research (see below), voice search and virtual assistant adoption among brands and local merchants is 5 percent and 7 percent respectively. This shows that there’s a way to go — and an an opportunity to help them get there. Where will they need help? Among other things, the impetus is stronger than ever to update and optimize business details. Limited SERP inventory creates new rules and greater competition for that one result. In some ways, this is analogous to the transition from desktop to mobile. A Street Fight report is in production that will go deeper into the topic of voice search and voice assistant apps.